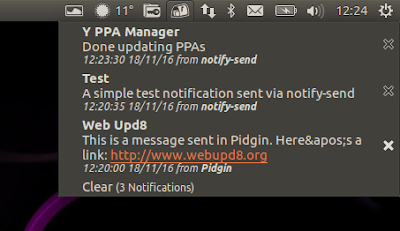 Recent Notifications is an Ubuntu Indicator that collects desktop notifications, displaying them in its menu. This is useful if you missed some important notification for various reasons, like being away from the computer, etc. I've covered Recent Notifications before, however, the last article on WebUpd8 dates back to 2011, so I decided to post another article about it (and redirect the old ones to this one), especially since the indicator changed / improved since then. Recent Notifications indicator collects notifications sent with libnotify to a notification daemon, such as NotifyOSD, and supports Unity, Xfce, MATE and GNOME Flashback session. keyboard support: you can dismiss notifications using your keyboard. Press space to dismiss the notification but leave the indicator open, or press enter to dismiss the notification and close the indicator menu. Note that if you had to install the GTK2 version (if you're using Ubuntu MATE older than 16.10), both "notifications" and "notifications-gtk2" will show up - you'll need to change the options for "notifications-gtk2". The last two options are self-explanatory, so I'll only explain the blacklist option. This allows blacklisting applications so their notifications are not collected by Recent Notifications. The blacklist feature can be used to filter out less important notifications, like those sent by a music player, or the Sound Indicator (which displays notifications when changing the volume, something that's not really useful to have in Recent Notifications). 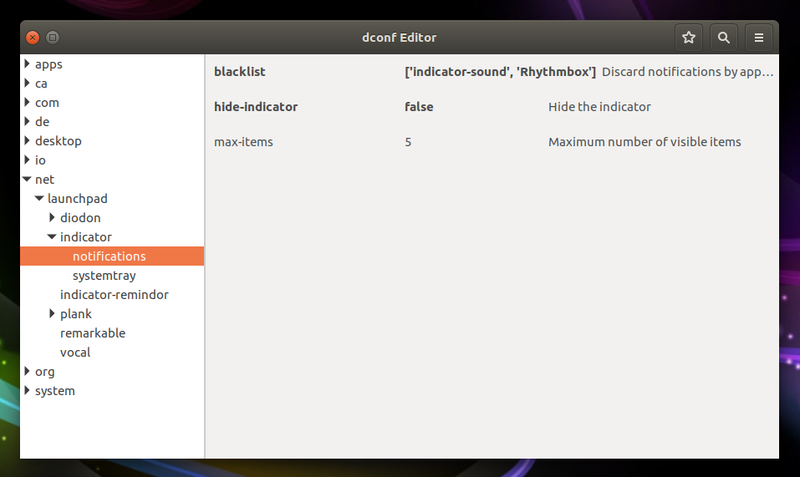 Blacklisting the Sound Indicator worked in my test under Unity, but it didn't under Xfce (Xubuntu). 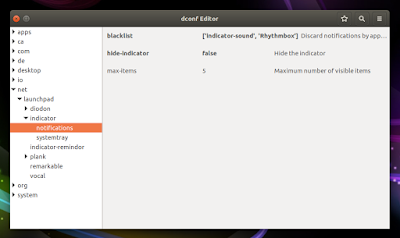 For MATE and Xfce, the Indicator Applet / Indicator Plugin is required for this to work (it must be added to the panel). Also, for Ubuntu MATE versions older than 16.10, you'll need to install the GTK2 version of Recent Notifications. Once installed, restart the session (logout/login) and Recent Notifications should start automatically.